These scarves are actually shorty style scarflettes. You'll also notice that they don't have the ruffle edging of some of my previous nuno felted scarves. I will be listing the new style scarflettes for sale in my Etsy shop this week. 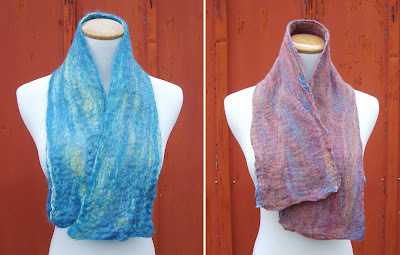 You can see more photos of these and my other nuno felted scarves on my flickr photo gallery. And, stay tuned to my blog because I'll be announcing a super special contest giveaway for one of my nuno felted scarves that will be hosted by the Felting Blog at CraftGossip. You'll have a chance to win a fabulously free scarflette! Awesome job on the nuno felting - I loved seeing the before and after results!